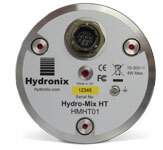 The Hydro-Mix HT is a high temperature, microwave moisture measurement sensor designed for applications in process control environments such as grain processing and animal feed production. 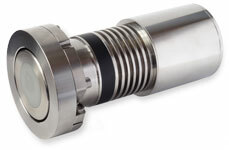 With an operating temperature range of up to 120°C, the Hydro-Mix HT is ideally suited to measure moisture before or after dryers or in mixing systems. The sensor measures at 25 times per second which enables rapid response to any changes in moisture content. It also features integral signal processing and a choice of measurement modes which allows the sensor performance to be optimised for measuring moisture in flowing materials such as grain, animal feed, nuts and pulses. Remote configuration, calibration, diagnostics and firmware upgrades can easily be undertaken using Hydronix Hydro-Com software. This allows direct integration with any control system without the requirement of any other interface unit. Combined with on-board functionality such as signal processing, smoothing and averaging, the Hydro-Mix HT is simple to integrate into any new or existing system. The sensor is designed to be fitted flush with the internal wall of a ducting system, a mixer or a screw conveyor (auger). To assist with installation the sensor is supplied with a fixing plate and clamp ring which enable the sensor to be easily and accurately adjusted.